Vitamin D3 - 2,000 IU / 90 Choc. Chew Tabs - Nature's Way®. 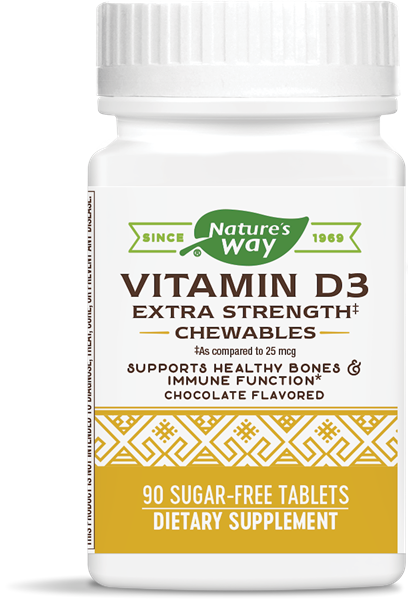 Why use Vitamin D3 2000 IU chewable tablets? Vitamin D3 provides an easy way to increase intake of cholecalciferol. And, since the chocolate chewable tablet is delicious, taking this supplement is easy to remember. For best results, chew 1 tablet daily with a meal, or as recommended by a healthcare professional. Do not exceed recommended dose. Caution: Consult a healthcare professional if you have a kidney disorder, hypercalcemia, hypercalciuria, are taking medications, or are pregnant or lactating.